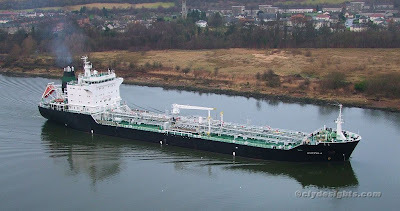 Many of the movements observed so far this year on the Clyde have been tanker traffic heading for Rothesay Dock, and this - the third such vessel to transit the river in the past four days - was caught as she headed beneath the Erskine Bridge on her way to discharge a cargo of products loaded in Copenhagen. Italian owned, CURZOLA was built in Croatia in 1993 and is 142.3 metres in length. She has a deadweight of 13,991 tonnes. Most of her crew are Italian.